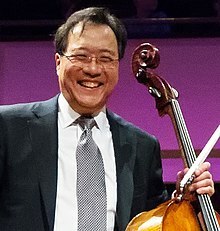 Yo-Yo Ma (born October 7, 1955) is a Cheenese-American cellist. Born in Paris, he spent his schuilin years in New York Ceety an wis a bairn prodigy, performin frae the age o fower an a hauf. He graduated frae the Juilliard School an Harvard Varsity an haes enjoyed a proleefic career as baith a soloist performin wi orchestras aroond the warld an a recordin airtist. He haes recordit mair nor 90 albums an haes received 18 Grammy Awairds. ↑ 1.0 1.1 Kosman, Joshua (November 2005). "35 Who Made a Difference: Yo-Yo Ma". Smithsonian Magazine. Retrieved 29 July 2016. ↑ Hatch, Robert; Hatch, William (2005). The Hero Project. McGraw-Hill Professional. p. 82. ISBN 0-07-144904-3. Retrieved September 8, 2007. This page wis last eeditit on 24 November 2016, at 19:39.